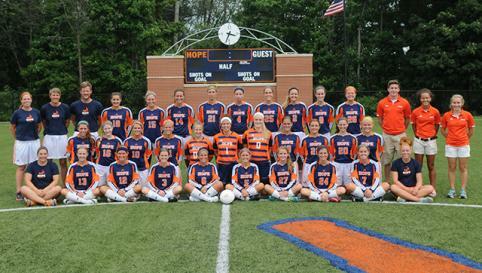 The Hope College women's soccer team is aiming this season to improve on the Flying Dutch's second-best season in school history. Coach Leigh Sears’ 2014 roster of 28 players features nine seniors, two juniors, nine sophomores and eight freshmen. Hope kicks off the season on Friday and Saturday, Aug. 29-30, with two nonleague matches away from home. The Flying Dutch will play at seventh-ranked Wheaton (Illinois) on Friday, then Carthage (Wisconsin) on Saturday at Wheaton. Four seniors will captain Hope this season: senior forward Lindsey Bieri of Holland, Michigan (Holland Christian HS), midfielder Erin Jipping of Holland, Michigan (West Ottawa HS), forward Nora Kirk of Maumee, Ohio (Notre Dame Academy), and defender Courtney Schmidt of Lowell, Michigan (Lowell HS). The Flying Dutch were picked second in the Michigan Intercollegiate Athletic Association preseason coaches poll. Hope is coming off a 2013 season in which the Flying Dutch posted a 16-4-1 record that was the second-highest, single-season win total in team history. The Flying Dutch finished third in the regular-season MIAA standings and qualified for the league tournament. Hope returns two of the three players who received national post-season recognition last season and helped the Flying Dutch match their 2005 team-high for most all-region selections in one season. Bieri and Jipping garnered Central Region Second-Team Honors from the National College Coaches Association of America. Jipping shared the team lead with 20 points on five goals and 10 assists, while Bieri chipped in three goals and five assists. Jipping also made the All-MIAA First Team in 2013. Bieri and senior goalie Kat Dickson of Grayslake, Illinois (Grayslake Central HS) were All-MIAA Second Team. Kirk returns after being named Hope’s MVP by her teammates in 2013. She topped Hope with 63 shots and finished third in scoring with six goals and four assists. Senior defender Maria DeShaw of Holland, Michigan (West Ottawa HS) is back as well. She was selected the Flying Dutch’s Defensive MVP last season. Hope also returns sophomore defender Jessica Lockwood of Kentwood, Michigan (Grand Rapids South Christian HS), the Flying Dutch’s 2013 Rookie of the Year. Sears is entering her 14th season as Hope’s head coach Hope. She has compiled a 143-94-16 record during her tenure with the Flying Dutch. The Hope College volleyball team returns to the court in the 2014 season as one of the top teams in the nation. The nationally ranked Hope College men's soccer team is poised in 2014 to continue an extended streak of success that includes 15 consecutive winning seasons.